It's a tricky business buying for 2 year olds. 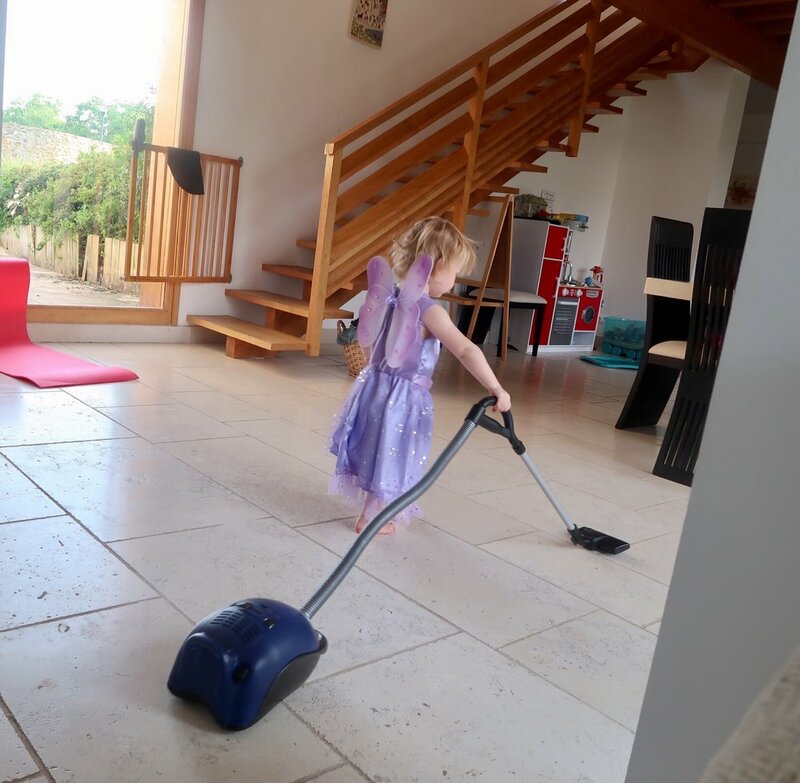 They are no longer a baby, and are becoming independent little people who want to be doing everything, but don't always have the skills and the patience. The key is finding toys that are age appropriate, safe of course, but that also they will grow with because the change from the second to third birthday can be big. All of these toys that I have recommend below are also played with by my 3 year old, and I think they will last for years. She'd already had the small size Puky balance bike for some time and LOVED it and was really proficient on it (we reviewed this within in an earlier toddler toys blog, along with lots of other ideas), so my husband decided as she was getting on so well that she would appreciate a bigger, faster balance bike with racing handlebars! And so we (he!) got her the Early Rider Road Runner balance bike when he was away at a cycling event. Having just looked it up online it would seem he was a little economical with the truth in relation to how much he spent on it!!! That said, it really is FANTASTIC, and looks the business as well. She's on the tall side for her age but is only just tall enough for it now at 2 (it is recommended from age 3), but she is getting on well and it just oozes quality. Her big brother has had a go and was as fast as lightening on it! The grandparents were very generous with a collection of miniature animals, most of which are the brand Schleich or similar high quality. We chose farm animals, but you can buy all sorts of different types, and historical/fantasy figures too. She loves them and has just reached the right age. I love that she can add to her farmyard over time too. The Schleich ones are really detailed. They are perfect for imaginative play with her big brother too. I had these as a child and loved them. Indeed my parents still have mine, and have produced them 30 years on for the grandchildren to play with. An investment that is well worth it and should be played with for years. She also received this gorgeous wooden Melissa and Doug Horse Box, complete with 2 toy horses, which came from the online shop Magic Fairy Wings. This toy oozes the usual quality and design that you would expect from Melissa and Doug. The horses are solid but felt covered, so are different to the plastic ones that came with the Melissa and Doug Show Horse Stables that she got for Christmas, but she plays with them all together and doesn't seem to notice. In fact she strokes these new ones as they are tactile! She has played with this a lot since her birthday as it is the perfect size for her little Schleich animals to be transported around in. 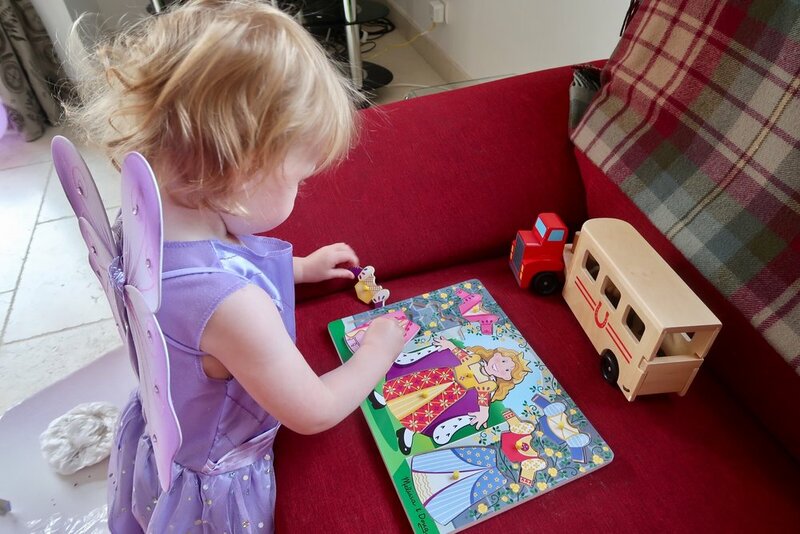 The Melissa and Doug Princess Dress Up peg puzzle from Magic Fairy Wings is also really lovely. I have a princess mad 2 year old (who is equally into bugs, mud, climbing and cycling - its brilliant!) and she is just getting the idea of changing the different outfits on this, and I can help her to learn her colours at the same time too. Magic Fairy Wings has many other puzzles as well, at great prices, that are worth checking out as they are fun and educational. With all of her new toys to store somewhere (and transport to Granny and Grampas, and take away on holiday/camping with us!) a solution appeared as if by magic from Magic Fairy Wings, in the form of the Trunki Travel Toy Box. Not only does this usefully and neatly tidy everything away, but it has a dimension of fun as well. It possesses the quality of design and manufacture that we have found with all of the Trunki products we have owned, and been very impressed with. As well as a mere container for "things", this toy box has wheels which you can ride around on AND you can turn it into a rocker. The people at Trunki must have fun designing these products, and they know kids! However, I can usually peacefully resolve cleaning squabbles with the other cleaning toys that we already have. When my son turned two he received the Melissa and Doug Pretend Play Cleaning set, which contains a mop, sweeper, dustpan and brush and duster. It has been played with by both of them so much, and all children that visit us. Yet despite this it has worn well (although the hanging strings have had to be replaced a few times on some of them). I would highly recommend it. Two is a perfect age to introduce or increase a Dolls/Baby collection, for a boy or girl, as imaginative play is really taking off around now. My daughter got a lovely wooden highchair and 2 Ikea Duktig Dolls beds which are just perfect. She adores them, and I love their look and quality for the price. Of course it doesn't have to be for baby - Anna and Elsa are going down for their nap here! In the photographs above, you've probably noticed that (when she wasn't in her PJ's!) my daughter looked rather fairy-like... and you may have even spotted the little heels that she was cycling in (!). Her love of dressing up has been building for weeks now, and she got this beautiful little outfit with accessories as a gift. Fancy dress is a great idea for a 2 year old. Normally we don't do this, but my son got a little gift too on my daughter's birthday. Mainly this is thanks to my seeing this Track Laying Wagon on Magic Fairy Wings and being unable to resist! I knew he would be so excited about it. It is no understatement to say that my son is "obsessed" with his trains, and has been for the last 18 months, since he received a Brio set for Christmas just before his second Birthday. He has been delighted with his Big Jigs "Track Laying Wagon" train which contains a train, crane and piece of track which can be raised, swivelled and laid with the aid of a magnet. He calls it his "crane train" and talks to me about it daily (no exaggeration). If you have a train mad child, this is a fantastic addition to a growing set of wooden track and trains. The Big Jigs sets are compatible with the Brio we already have, and the quality and design are comparable too. Cake Hack (inspired by Alison's Five Little Stars Instagram post) - if you don't have time to make from scratch - use little figures you already have on top of a shop bought cake! I hope you find all of these ideas helpful. But, if you are still searching for inspiration, why don't you check out our other Toddler Toys Review for more ideas, or how about some Musical Instruments, or a TeePee/Wigwam!